The blues as a musical genre are everywhere. Even when you don’t realize you’re hearing something that has been influenced by the blues, you can bet the influence is there. Chuck Berry, The Rolling Stones, Led Zeppelin, Toby Keith, Poison, Bon Jovi, and Cinderella are just a few of the bands that have been influenced by the blues, some more than others, but influenced just the same. The blues permeate our musical culture, and any new guitarist should at least invest a little time into blues lessons. But I don’t want to play the blues, you might say. Whether you want to play the blues or not, blues lessons can help you express yourself more fully in your playing. If you’re a songwriter, studying the blues can be beneficial to your craft by teaching you a bit about endless creativity in a structured setting. That’s because, for all its improvisational freedom, the blues as a musical form is really pretty structured. You don’t need to spend years taking blues lessons to understand the blues. Take a look at the examples below. This is a comparison between two types of blues scales, the major blues scale and the minor blues scale. Compare those two scales to what you know about the major scale. Which notes are left out and which notes are altered (in the case of the blues scale, flatted or lowered)? Those notes are the “blue” notes—the notes that make the blues sound like the blues when played against a twelve bar blues pattern in the key of your blues scale. That’s all you need to know about the blues as far as theory goes. Too much more than that and you might spoil the broth. There are some blues techniques to be aware of too. The illustration below shows a blues piece with heavy note bending, indicated by the curved lines. Notice that the bends range from a step to a step and a half. Bends of all sizes are essential to the expressiveness of blues guitar playing. Additionally, trills and heavy vibrato are featured elements of the blues. These techniques, when combined with the notes of the blues scales above, are the foundation of blues guitar playing and the only blues lessons you need. Get a feel for the twelve-bar blues form (shown below) and play through it. 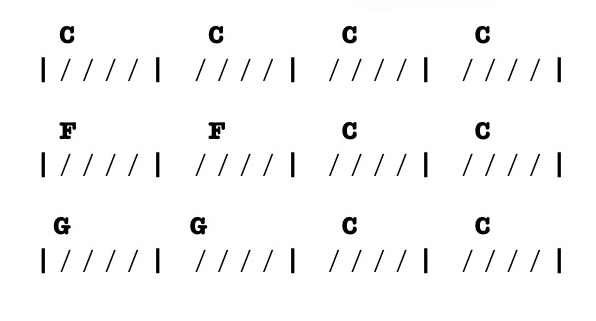 Notice the chords in this progression (key of C) are the first, fourth, and fifth chords in the key of C. You can vary these chords by playing them as seventh chords. Record this progressions and then experiment with the scales and techniques above. You’ll have your guitar “singing” the blues in no time.